Yalta, the most prosperous of Crimea’s south-coast cities and a glittering holiday destination of the past and the present, was not only where the Russian playwright and author Anton Chekhov built his famous belaya dacha (white cottage), surrounded by the cherry orchard that is synonymous with his name – it is also where he fell in love with Olga Knipper, the stage actress who later became his wife. An essay entitled OL Knipper in Yalta and Gurzuf (found in one of the most comprehensive virtual libraries of Chekhov’s writing) chronicles the pair’s burgeoning love affair, which began in Yalta in the summer of 1899. Chekhov and Knipper had first met the year before that, on September 9, 1898 (coincidentally her 30th birthday), when she was rehearsing his play The Seagull. Chekhov, at that time Russia’s most eligible bachelor, watched her perform and took an interest. 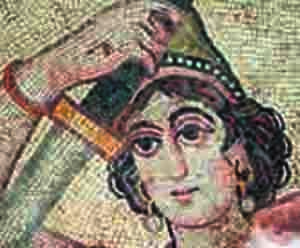 The following year, while Knipper was holidaying with her brother in Tiflis (now Tbilisi, capital of Georgia) and Chekhov was in Taganrog (a port city on the Sea of Azov, northeast of Crimea), they exchanged letters and Chekhov invited her to Yalta. She had never been there before and was keen to visit. They met up on July 18 in Novorossiysk (just across the sea from the Kerch Peninsula) and left on a ship that same day. 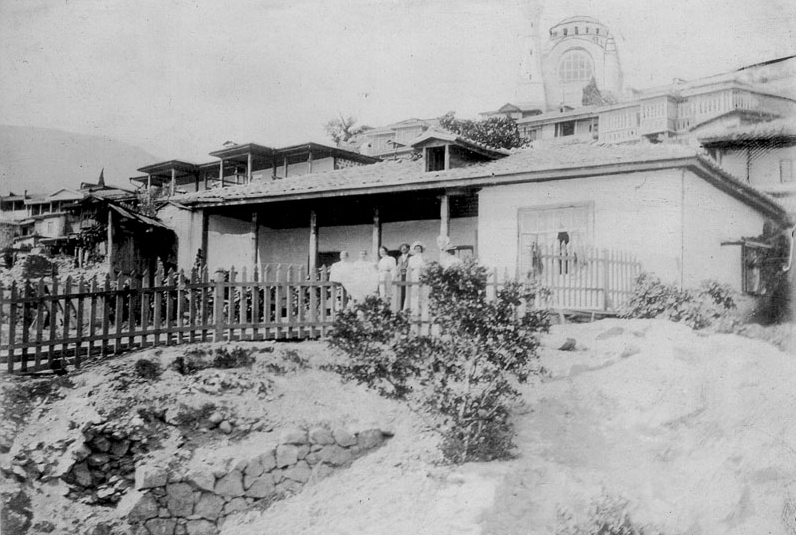 Reaching Yalta two days later, Chekhov settled into the Marino Hotel (which still exists to this day), while Knipper went to stay with family friends in Gymnasium Street, three kilometres away. Despite not sleeping under the same roof, the pair spent their days together, often going to Autka (a village close to Yalta), where Chekhov was building his belaya dacha, in which Knipper had expressed great interest. They took many walks through the areas around Yalta, enjoying such sights as the Uçan Su (Flying Water) waterfall at Massandra, and visiting Gurzuf (where Chekhov was eyeing up another dacha to buy) and Oreanda. Chekhov was proudly showing Knipper all the splendours Crimea had to offer and later described them in a story, Lady with the dog (first published in December 1899 in Russkaya Mysl – translated as Russian Thought – magazine, one of Russia’s most popular magazines of the late 19th and early 20th centuries, which published stories and essays by many great writers). Lady with the dog tells of a married banker who has an affair with a young woman while holidaying in Yalta. Although Chekhov himself was unmarried, his choice of subject matter certainly echoes the relationship that was forming between him and Knipper that summer. After two weeks of getting to know each other, they left for Moscow on August 2 – a journey that would become one of Knipper’s lifelong memories. 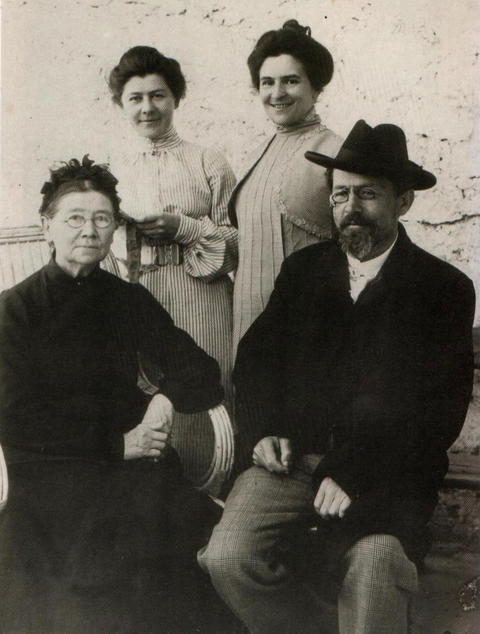 The following April, Knipper returned to Yalta with Chekhov’s sister, Maria Pavlovna, with whom she had developed a friendship. Knipper stayed in Chekhov’s house, enjoying one of the sunniest rooms with a view out onto the garden. On April 14, the Moscow Art Theatre, the company to which Knipper was attached, came to Yalta and over the course of a week performed Chekhov’s Uncle Vanya and The Seagull, as well as two other plays. All the locals and tourists visiting Yalta congratulated their favourite author, Chekhov, on his success, and he was presented with a palm branch tied with a red ribbon bearing the words: ‘To Anton Pavlovich Chekhov, who can profoundly interpret Russian reality. 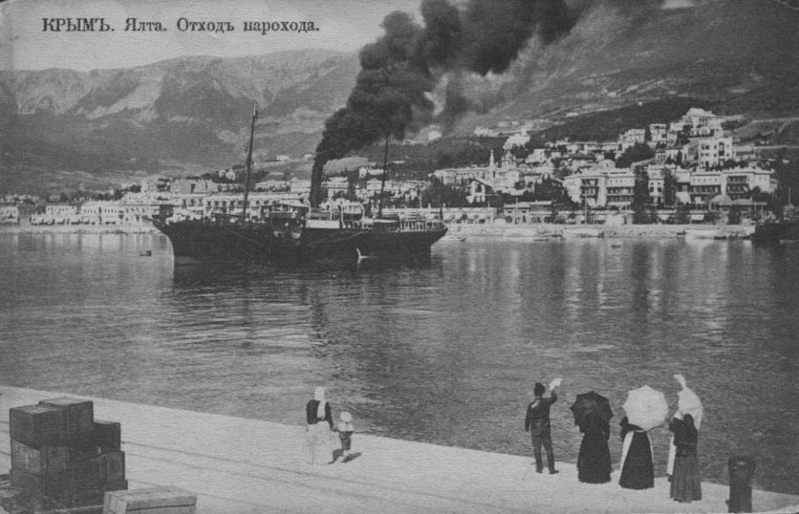 Yalta, April 23rd, 1900’. The couple would look back on that week in Yalta as one of the happiest times of their lives. Knipper returned to stay with Chekhov in Yalta from the end of the following March until mid-May. On May 25 they were married and left for a honeymoon in the Ufimsky District (in the Republic of Bashkortostan). After their return to Yalta on July 8, Knipper stayed on for another a month and a half and, though she was based in Moscow, continued to seize every possible opportunity to head back to Yalta, even if just for a few days. The couple’s final time together in Yalta was between July 9 and September 19, 1903. The following year Chekhov died and Knipper was left to spend her summers there alone. As the place that immortalised their union it would always hold a special significance for her. Knipper returned to Yalta every summer (except during the Second World War), staying in the Gurzuf dacha, left to her by Chekhov in his will. It was her favourite place and the house seemed to come to life whenever she was there. Very often she had visits from famous guests: artists and writers such as Alla Tarasova (a fellow leading actress of the Moscow Art Theatre), the renowned Soviet pianist Sviatoslav Richter, Ivan Kozlovsky (one of Russia’s greatest tenors), and the writer Boris Lavrenev. Knipper last visited Gurzuf in 1953. Unsurprisingly, given her deep connection with the place, she was anxious to leave the dacha to someone or something she believed in. She finally decided on the Art Theatre. That year, she wrote a letter to an actor friend, Dorochin: ‘I am really worried about my Gurzuf house. This is very serious and very urgent. I want to go to the highest authorities. I want to tell them how beautiful the nature is around here and ask them to pass the house to the [Art] Theatre, even when I am still alive. It holds all our [hers and Chekhov’s] memories’. Unfortunately, it was not to be, and it was only in 1987 that the Gurzuf dacha became a filial of the Chekhov and Knipper-Chekhova museum in Yalta. Many things in the museum provide glimpses of Chekhov and Knipper’s life together. One unusual item is a tablecloth signed by more than 80 guests who visited them over the years, their handwritten signatures embroidered with coloured thread. There is also an extensive collection of photographs, including idyllic scenes of Yalta, and of the happy times Chekhov and Knipper spent there.